There is going to be a lot of Angry Birds posts this week. 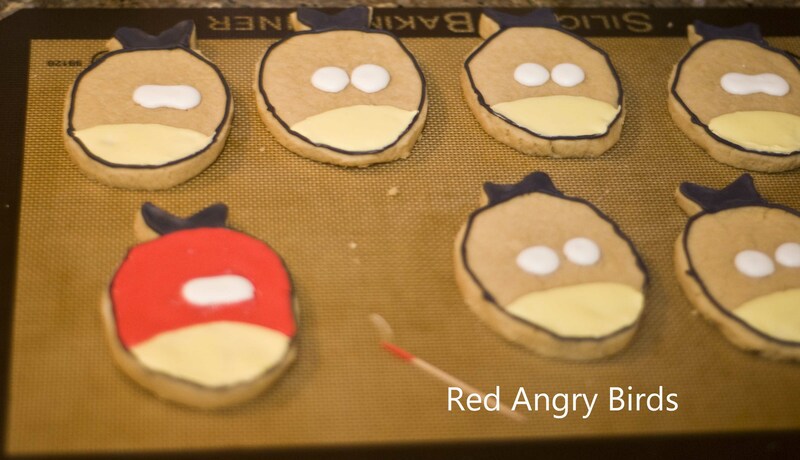 My son wanted an Angry Birds birthday party. However, there isn’t a lot of Angry Birds stuff you can just buy out there in terms of already made games, small toys, plates/napkins, balloons, etc. After much digging on the internet, here is the party I came up with. I disregarded quite a few game ideas I saw on the web because we already did “pin the tail” last year and “find the eggs” as well for the Dinosaur party. Dinosaur party – tons of stuff out there. 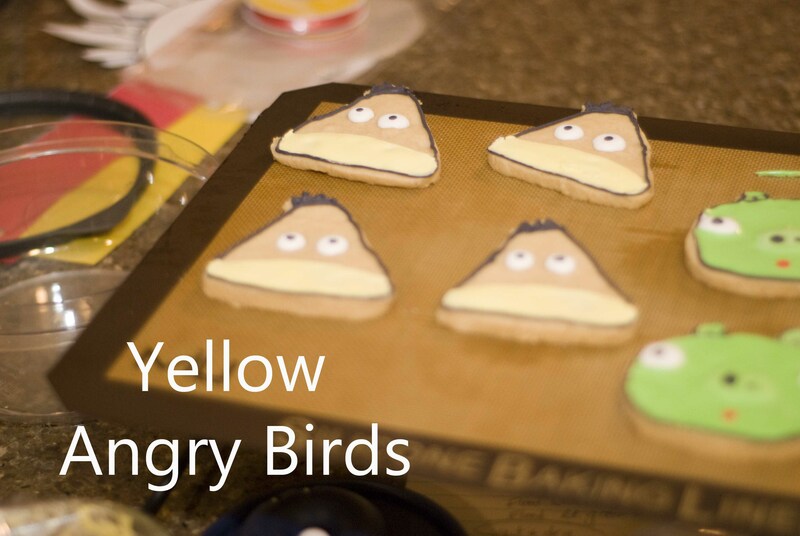 Angry Birds, not so much! Here are the cookies I made for party favors. I know I know – yellow bird is NOT yellow on top. I apologize. Most pros recommend 2 batches of the royal icing recipe below. I had enough for one and didn’t estimate enough yellow icing. 1. Preheat oven to 350. 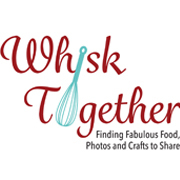 In a small bowl, whisk together the flour and baking powder. 2. In a large bowl, cream the sugar and butter together. Add 1 egg, and the extracts. 3. On low speed, add the flour little by little. Scrape the bowl making sure all the ingredients are mixed together. You don’t need to overbeat it. 4. Have two large pieces of cling wrap ready on the counter if you are going to not use it immediately. Scoop half of the dough into your hands and form into a ball while removing. It will be crumbly, so just keep putting it together into a ball, then form into a disk. Wrap in the cling wrap and store in the fridge. 5. If you are using immediately, obviously don’t store it in the fridge. Scoop it up and knead the dough together. Place it on a floured surface. Roll to about 1/4″ thick. Cut into shapes. Place shapes on parchment or silicone mat. Freeze for about 5 minutes. 6. Bake at 350 degrees for 10-12 minutes. Make sure they do not brown – they will be overdone then. 1. Using the paddle attachment, stir to combine the powder and water. Stir until foamy. 2. On LOW, add the powdered sugar. Add in corn syrup and extract. Increase speed to medium-high for about 5 minutes. Watch carefully to see when the icing becomes glossy and stiff peaks form. Do not overbeat either. This will be the icing brittle when dry. ** When making red icing, I would highly advise getting “no taste red” or just not using it. It really makes the great cookies not taste so great. **Outline piped with a #2 tip. Flooding done with #3 tip or Wilton candy squirt bottles. Outlined the Red Angry Bird and filled with white flood icing for the eyeballs, light yellow flood icing for the belly and black flood icing for the hair and pupils. Outlined the Yellow Angry Bird and filled with white flood icing for the eyeballs, light yellow flood icing for the belly and black flood icing for the hair and pupils. Come join the fun at the My Baking Addiction and GoodLife Eats Holiday Recipe Swap sponsored by Beanilla. You have me literally laughing out loud! Thank you dear. Just checked your website. Secret recipe club?! How cool is that! These are great. Would you be able to add Pinit? to your share options? That is a great idea! I will start researching how to put a pinit button on my items. Thanks so much! Thanks for this info. 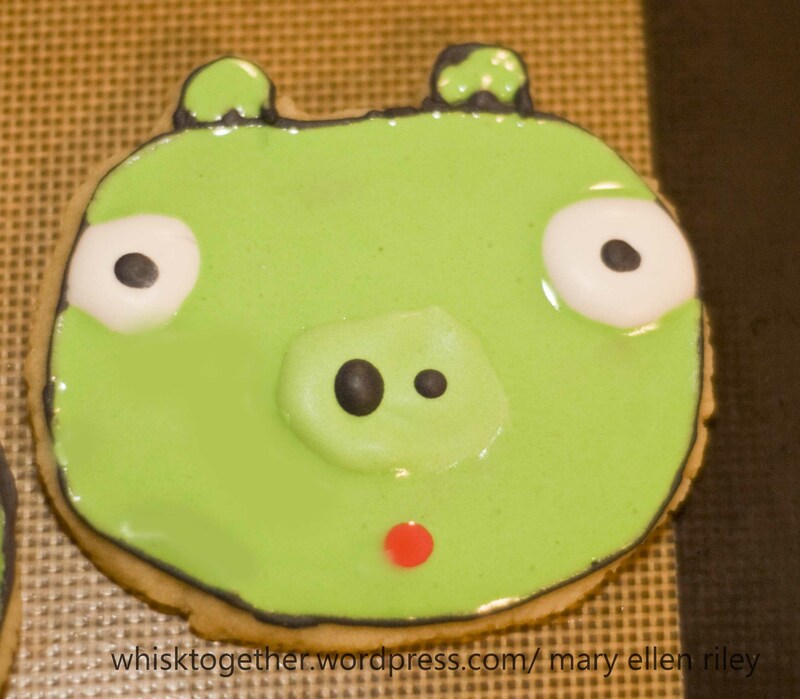 I’m considering doing this for my son’s 6th birthday but I’m not very experienced with icing. Also, how did you cut out the shapes? 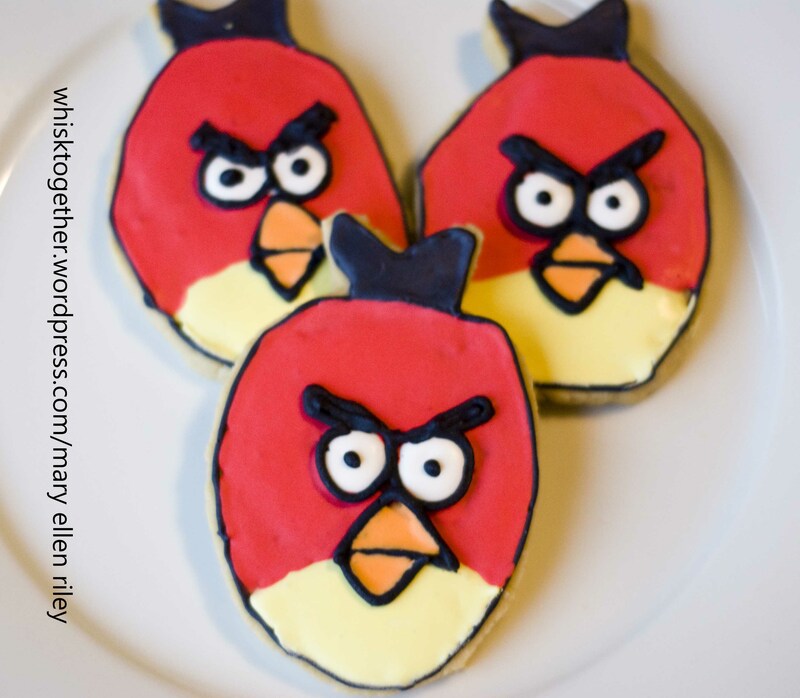 I didn’t have angry bird cookie cutters, so I took my circle, oval and triangle cookie cutter and used them as templates on white notebook paper. Then I altered the design by adding the feathers on the notebook paper. I cut out the shapes from the paper and then placed the template on the cookie dough. Using a sharp paring knife, I cut around the paper to create the cookie shape. 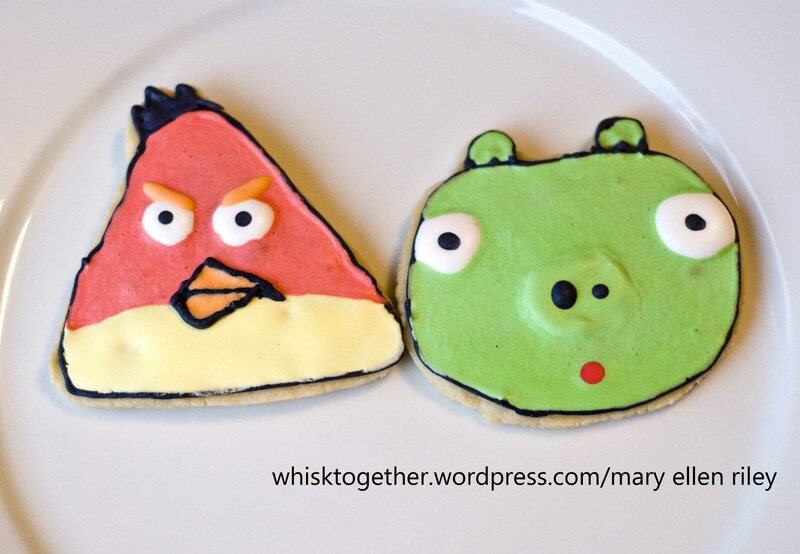 You can do this for any cookie that you want and create all kinds of shapes! Cookie cutters just make things a little faster.